Lots of people are getting interested in Forex trading every now and then. Some are looking for steady income, while others see it rather as a hobby. There are also traders who do it with the purpose of education, in order to understand the way economies and markets work. Of course, some people are simply looking for a way to get a quick profit. In any case, everyone who deals with currency trading is expecting to get substantial Forex returns. It doesn't matter whether a source of income is the main goal for starting FX trading or not, traders would like to get rewarded for their time and skills investments. What is important, it's to keep expectations realistic. While it is true that really successful traders can make a fortune from their buy and sell orders, no one can get rich all of a sudden. It takes a lot of time to learn about the market, get a feel of trading as an activity, develop one's own strategy, and adjust the latter to one's own individual style. There is never any good from trying to earn it all from the very start: there is a big chance that a trader who seeks quick profit will end up losing his or her capital pretty soon. Normally, profit is generated slowly but steadily, as the experience is gained and accumulated. 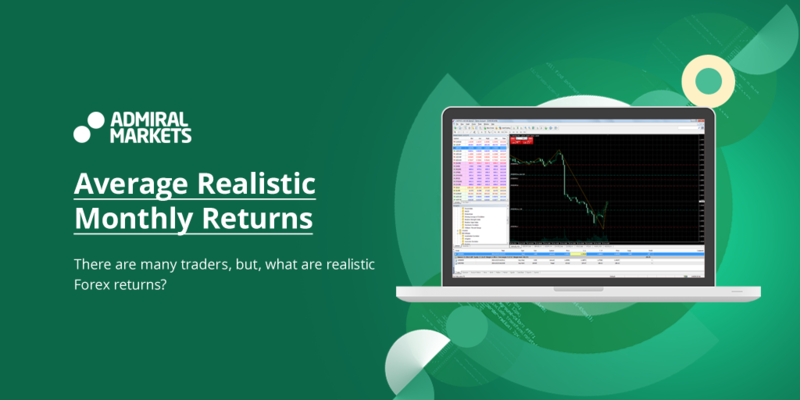 In the current article, we will talk about the realistic Forex returns that a person who deals with currency trading can expect. Because the potential gains are not the same for traders with different trading experience, we will try to estimate the possible returns for each of these categories. It is essential to remember that a newbie trader will never make as much money within the first few months as a professional who's been involved with Forex for years. It is the same for any activity. If you have never painted before, you won't be able to create a masterpiece the very first time. Also, you won't do a 40-mile marathon when the maximum distance you have run was a mile or so. It only means that you must have realistic goals that match your level of trading experience. Of course, any activity should be rewarded, and that's why we will talk about the realistic Forex returns in the article below. What kind of profit are you looking for? What about the risks involved? The first part of the article will be about the key aspects of revenue from trading currencies. Returns in dollars or returns in %? There are online brokers and trading platforms which assure you that 10 thousand USD monthly, several thousand daily, or $500 hourly is a possible case scenario for any trader. Such claims should make you alert at once, as they smell of false promises. The reason is not that such sums are impossible — a true trader should know that Forex returns are measured in %, but not in USD (or any other currency). The figures themselves do not mean anything. Any revenue depends on your investments, and a figure you earn should be transferred into percentage. $10,000 a month would be nothing if you invest $10 million, and, vice versa, it would be impossible with an investment of $1,000. It's normal to have certain expectations of the minimum profit in exact numbers, but it should be commensurable with your own trading capital. Consequently, the more you want to earn, the more you need to invest. Everyone can become a Forex trader, as the market is absolutely open to join. However, everyone who gets on the trading path should remember that this activity is associated with high risks, as the currency is volatile in price. So, when you are thinking about your average Forex returns, you should remember that they can be equalled to the risks. For example, there is one instrument in currency trading that allows increasing profits a lot. That's leverage we are talking about. The higher leverage ratio you take, the bigger amounts you risk. A lot of beginning traders forget about that when they are dreaming about high monthly earnings in Forex. You should remember about the risks always when estimating the profits you can get as a result of trading. Don't play with leverage, so that you don't turn your potential sky-high earnings into devastating losses. Also, you should include risks into any revenue-related calculations and let them not exceed 2% of your capital in a single trade, especially when you are a rookie trader. If you invest something, you normally get your interest for this. Although it's not big, it is a revenue all the same, once it's summed up. Surely, currency trading cannot be equalled to saving, but the principle of accumulated profit applies here the best. In Forex trading, returns are often high not because you can get a high one-time profit from one trade, but because you earn consecutively and learn to increase your profits step-by-step. So, what is the realistic prognoses for the sum I can earn as a trader? Your returns are a matter of your experience, investments, attitude towards risks, and the applied strategy. You might be one of the impatient traders who want to earn as much as possible. On the other hand, there are professionals who usually value the process of trading itself. If you are aiming for a profit of more than 5% of your trading capital, then we'd recommend you to think twice. When you risk 2%, which is the upper margin of the acceptable risk level, you can get up to 5%. However, risking that much is not advisable for a beginning trader. The best prognosis for your Forex monthly returns (if you don't have years of experience behind) is about 3-5% of your investments. Again, it all depends on how much you can manage the risks and deal with the potential of losses. There are different categories of traders, in terms of their Forex experience. Of course, beginners, seasoned traders, and real professionals would expect different levels of revenue. In our last part of the article, let's see what the expectations of every trading category should be. At this stage, we have not much of good news for you. To say it simply, you should lower your expectations, as it's possible that your losses will exceed your profits. It just might happen that you will lose all your trading capital on trials and errors. So, when you are just a beginner, you should be learning to trade as much time as you can. Hours of practice help to get your first revenue much quicker. A good advise for you will be to start trading with a demo account rather than with your real money. In this case, your learning will provide you with results, but will spare you of the real financial losses. When you have learned what the risks and losses are, you have gained some invaluable experience that will help you to become a professional. You should accept your failures and analyse them carefully, which will ensure that you won't do the same mistakes again. You might become more careful from now on, and the profit will finally come to you. So, how much are you going to earn as your Forex returns monthly? Perhaps, you should be looking into 1%, if you are acting carefully. Remember that it's better to accumulate your profits and experience slowly than blow everything up again. On the final stage, you can already think about making a living from trading. The sum of your potential Forex monthly returns can be estimated in relation to your expected financial needs and expenses. How much do you need a month to feel comfortable? Let's say, it's $3,500, so that you don't have to restrain yourself from acquiring things you need. If you are a professional trader, your profit would be about 4% of your investments. This means that your initial trading capital is bigger than 100 thousand USD. You should always have some spare money (it will be deducted from your revenue) to cover the potential losses or fees for keeping your positions open for longer periods of time. In the article, we tried to inform you on how much you can earn when trading Forex. It is important to remember that your revenue will depend on your experience, your willingness to take risks, your investments, and your strategy. However, the most important of all those factors is real-life trading experience. The more you practice, the better you can control the risks/revenue ratio and the better you know how to avoid the possible losses. If you learn and earn constantly and regularly, pretty soon you'll be making a living as a Forex trader.